I’ve switched from TBT Porcelain to an in-house earthenware clay known as “recycle” – it’s made from scraps of all the clay used in the studio, plus a little grog from failed pieces, plus a little sand. 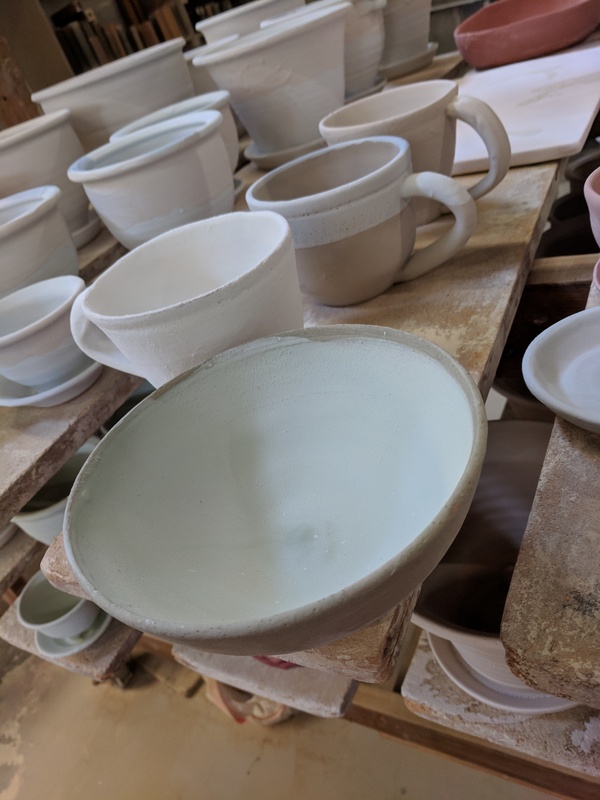 It throws bigger and lighter than porcelain, it’s both easier and harder to work with, and I’m enjoying the change. But it also does different things with glaze; Porcelain fires white, while recycle fires… Sandy-pink-brown? As you might imagine, the colors are then different for the same glaze. Glazed light blue, one dip. And the bowl is bottom-dipped in gray-blue, rim dipped in medium blue (with some splashes for visual interest) and the inside is peacock. Finished glaze photos in *hand waggle* a week or so?